Maria Longworth Nichols Storer founded Rookwood Pottery in 1880 as a way to market her hobby – the painting of blank tableware. Through years of experimentation with glazes and kiln temperatures, she eventually built her own kiln, hired a number of excellent chemists and artists who were able to create high-quality glazes of colors never before seen on mass-produced pottery. Pictured right: An Earthenware Vase – Maria Longworth Nichols and Albert R. Valentien for Rookwood, 1883. In the dull finish, decorated with a frog conducting a choir of ducks amidst Oriental grasses, chased around the neck and foot with a fire-on-gold honeycomb motif, signed in gilt MLN, incised A.R.V. and impressed Rookwood 1883 Y 162 with the kiln and anchor mark, and with remnants of paper label. Sold for $9,400 at Christies, New York, 2001. The earliest work is relief-worked on naturally-colored clay, in pinks, greys and sage or olive greens. Some were gilt, or had stamped patterns, and some were carved. Often these were painted or otherwise decorated by the purchaser of the “greenware” (unfinished piece), a precursor to today’s do-it-yourself movement. However, such personally-decorated pieces are not usually considered Rookwood for purposes of sale or valuation. 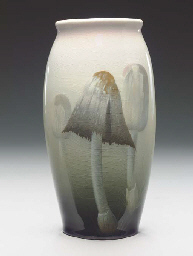 Pictured left: Kataro Shirayamadani vase which currently holds the highest price for a Rookwood piece at auction selling for $350,750 at auction at the Cincinnati Art Galleries in June 2004. After this period, Storer sought a “standard” look for Rookwood, and developed a number of very common treatments: the “standard glaze,” a deep gold, red and orange over dark brown fired in such a way as to effect a very high-gloss finish, often in leaf or flower motifs. A series of portraits – often of generic American Indian characters or certain historical figures – was also produced using these particular glazes. Next was the “matte glaze,” a flat but textured glaze developed by Artus Van Briggle, often painted on soft colored clay, which used “sea green” for aquatic and floral motifs. This pale blue-green glaze was usually applied over a soft yellow, bluish or red base. Another common Rookwood style of this period was the “vellum” glaze, usually a matte light blue, put on top of a very lightly-colored clay. This was most often used for landscape scenes. 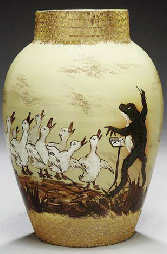 Pictured right: An Glazed Earthenware Vase Carl Schmidt For Rookwood, 1907 7¼ in. (18.5 cm.) high firm’s impressed mark and 917C, with artist’s monogram CS sold for $3,107 at Christies, New York, 2004. 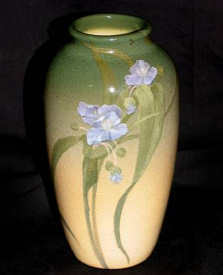 Other popular styles that came out through the lifetime of the Rookwood factory included the “iris” glaze, a high-gloss white over pinks, blues, and yellows and usually used for floral motifs, and the less-common but very collectible “tiger eye” which left gold streaks from ingredients in the glaze. This last glaze was unstable and it is not clear whether it was abandoned for reasons of chemistry or popularity. One of the last styles of Rookwood was the “ombroso” glaze, not used until after 1910. 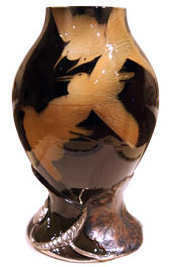 Ombroso, used on cut or incised pottery, is a brown or black matte glaze. In 1902, Rookwood added architectural pottery to its portfolio. Under the direction of Watts Taylor, this division rapidly gained national and international acclaim. Many of the flat pieces were used around fireplaces in homes in Greater Cincinnati and surrounding areas, while custom installations found their places in grand homes, hotels, and public spaces. Even today, Rookwood tiles decorate Carew Tower, Union Terminal and Dixie Terminal in Cincinnati. In New York, the Vanderbilt Hotel, Grand Central Station, the Mayo Clinic, Lord and Taylor and several subway stops feature Rookwood tile designs. Pictured left: A Rookwood ‘Iris’ glaze ceramic vase, Circa 1903 – The tapering cylindrical decorated with iris’s against a green shading to peach ground, with impressed factory date mark, numbers and artist initials for Frederick Rothenbusch Height 8 1/2in sold for $1,058 at Bonhams, Los Angeles in October 2005. The company was hit hard by the Great Depression. Architects couldn’t afford Rookwood tiles and mantels. Mass production potters churned out cheap look-alikes. By 1934 the company showed its first loss, and by 1936 was operating an average of just one week a month. On April 17, 1941, it filed for bankruptcy. The 1920s were highly prosperous years for Rookwood. The pottery employed about 200 workers and welcomed almost 5,000 visitors to the Mount Adams business each year. Nearly every local bride had a piece of Rookwood pottery among her wedding gifts. Even Mark Twain, who admittedly was not an art collector, visited the pottery and went on a shopping spree. The company was hit hard by the Great Depression. Architects couldn’t afford Rookwood tiles and mantels. Mass production potters churned out cheap look-alikes. By 1934 the company showed its first loss, and by 1936 was operating an average of just one week a month. Through these tough times, ownership of the company changed hands but the heart of the company, the Rookwood artists, remained and high quality pieces still left the Rookwood studios. In 1959 Rookwood was purchased by the Herschede Clock Company and production moved to Starkville, Mississippi. Unable to recover from the losses experienced during the Great Depression, production ceased in 1967. In 1982, Michigan dentist and art pottery collector, Dr. Arthur Townley, saw an ad for the assets of Rookwood Pottery. After making some phone calls, Dr. Townley was furious to learn that Rookwood was in the process of being sold to overseas manufacturers. In his estimation, these people were going to use the Rookwood name and churn out mass-produced cheap pottery. He immediately offered the sellers his life savings in cash for all of the remaining Rookwood assets. Throughout his tenure as Rookwood’s owner, Dr. Townley produced small quantities of pieces just to keep the original trademarks alive. His dream was that one day Rookwood be brought home to Cincinnati and started again, with the same aspirations for artistic excellence as it was in 1880. Over the years, Dr. Townley refused many offers to sell Rookwood, waiting for a potential buyer that shared his passion for making Rookwood great again. After meeting Christopher Rose in 2004, Dr. Townley felt he had met the person Rookwood was waiting for. Christopher’s enthusiasm for artistic merit and his commitment to stay true to original Rookwood traditions convinced Townley to allow him to take Rookwood back home to Cincinnati. In July 2006, after approximately one year of negotiations, The Rookwood Pottery Company entered into a contract to acquire all of the remaining assets of the original Rookwood Pottery from Dr. Art Townley. These assets include, among other things; the trademarks, more than 3,000 original molds and hundreds of glaze recipes used by the original Rookwood Pottery Company. On July 10, 2006, the Rookwood Pottery Company re-established a presence in Cincinnati. There is a new production studio in the historic Over-the-Rhine neighborhood of Cincinnati. The company has since produced a limited number of art pottery pieces such as the commemorative plaque in honor of the rededication of Fountain Square (October, 2006) and a beer stein in cooperation with Christian Morelein brewery to commemorate the annual Bock Fest (February, 2007). Cincinnati Antiques Expert Frank Loomis tells viewers about the history of The Rookwood Pottery Company, from its founding in 1880 by Maria Longworth Nichols to its closing in 1941 all the way to it’s modern day rebirth.